Today, the members of the Riigikogu expressed no confidence in Prime Minister Taavi Rõivas with 63 votes in favour and 28 against. There were no abstentions. 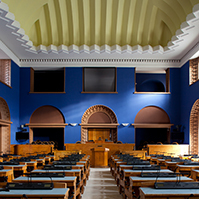 41 members of the Riigikogu opposition initiated a vote of no confidence in the Prime Minister on Monday. Upon resignation of the Prime Minister, the Government led by him also resigns. The Government will continue its activities until a new Government of the Republic assumes office. After receiving the letter of resignation of the Government, the President has to appoint a candidate for Prime Minister within 14 days, and give him or her the task to form a new Government. “When you express no confidence in the Government today, you vote not so much against me personally as the work that has been done over the past year and a half. 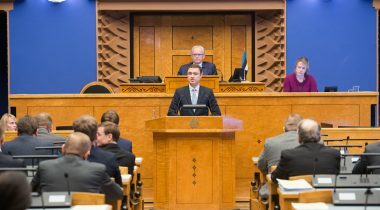 The members of the Pro Patria and Res Publica Union and the Social Democratic Party in fact vote against their earlier decisions and against the ministers from their parties,” Prime Minister Taavi Rõivas pointed out. 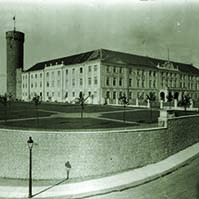 Rõivas said that the Government and the coalition more broadly had done their work well and efficiently. He added that he had had the great honour to serve the Estonian people and country as a Prime Minister in two Governments, and he had done that work with passion and dedication. Member of the Centre Party Faction Kadri Simson, who took the floor during the debate, said that, if a Government is led by an indecisive Prime Minister, it will bring about problems. 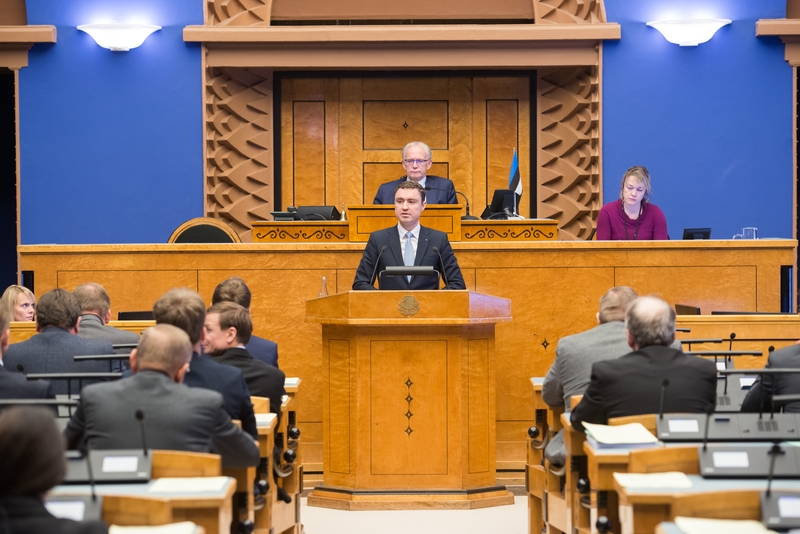 She added that the problems had been listed in more detail in the text of the expression of no confidence, and on the basis of them the members of the Riigikogu would vote in favour of the expression of no confidence in Prime Minister Taavi Rõivas. Andres Herkel from the Free Party Faction noted that the Government led by Taavi Rõivas had been somehow misformed in the beginning. He added that, for that reason, the Government was probably never going to be a team that would raise topical problems to search solutions for them together. He pointed out that it was apt to ask what the next Government would be like, and he spoke of what it was important to keep in mind as regarded the next Government. Martin Helme from the Estonian Conservative People’s Party Faction said that they wished the best Government for Estonia, and that was why they wished to remove the current Government from office. In his opinion, only one conclusion could be drawn from Prime Minister’s speech, namely, the Prime Minister or more broadly the Reform Party still does not understand what has gone wrong. Urve Tiidus from the Reform Party Faction pointed out that Estonia was facing political choices that had a strong leftist colouring to them. She said that time would tell what cooperation with rightist conservatives would look like. 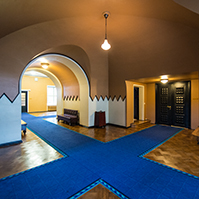 Tiidus said that the Reform Party would continue to implement a liberal policy that would secure Estonia’s independence. The speaker said that they would continue to stand for a rightist Estonia, and she was sure that they had allies in that. The Minister of Justice Urmas Reinsalu made a report on the implementation of “The Development Objectives of Legal Policy until 2018” this year. The Minister of Justice said that there was a plan to begin to prepare a new text of the development objectives of legal policy during next year. “It goes without saying that this will be done in cooperation with the legislator,” he added. The Minister emphasised that, in the implementation of the development objectives of legal policy, the Government had paid great attention to ascertaining the need for the Bill and drawing up a legislative intent, before drafting a Bill. Reinsalu said that the proportion of the legislative intents had more than doubled over the first half of the past two years. 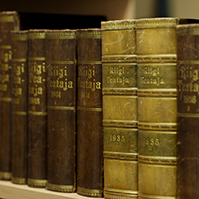 Reinsalu said that, in the light of the upcoming presidency of the Council of the EU, it was apt to draw the legislator’s attention to what the philosophy of Estonian legislative drafting would be in the future, and what it could be during the European presidency as the leader of the European Council working groups as well as the Councils of Ministers. Toomas Vitsut from the Centre Party Faction, who took the floor during the debate, pointed out that every initiative for an Act must be thoroughly prepared. He said that, besides initiating new Acts or amending an existing Act, all alternative possibilities that allow to reduce the volume of legislative drafting must be considered. Vitsut said that, besides legislative intents, more emphasis will have to be put on post-legislative scrutiny of legislation. Heljo Pikhof from the Social Democratic Party Faction raised the question of whether it is necessary to prepare a legislative intent at any cost if the constitutional institutions have found that a specific provision is unconstitutional or creates an unlawful situation, and an Act needs to be amended because of that. “We find that the shaper of a policy must have the right to take responsibility to decide on the need to amend an Act also when the problem concerns only a few or it is impossible to prove the effectiveness of the measure in every aspect at once,” she added. Pikhof also stressed the need for post-legislative scrutiny of Acts. Raivo Aeg from the Pro Patria and Res Publica Union Faction pointed out that the agreement that had aimed to reduce the volume of legislative drafting which had been incorporated into the current coalition agreement on the initiative of the Pro Patria and Res Publica Union had not achieved its aim and had not been realised. In his speech, Aeg also touched upon the issue of understandability and readability of Acts and legislation, and more active involvement of non-governmental cooperation partners in the drafting of legislation. Aeg said that although the necessity of the legislative intent has been debated often, the faction supported the Ministry of Justice and the Minister of Justice in consistent adherence to this principle. In his speech, Jüri Adams from the Free Party Faction raised the question of whether the obligation to make such reports should be abandoned. He said that he wished for the same thing that Rait Maruste had mentioned in his speech, namely that we could speak about topical issues of legal policy, and not about the way along which the papers proceed in the ministry. The Act on Amendments to the European Union Common Agricultural Policy Implementation Act (249 SE), initiated by the Government, brings the European Union Common Agricultural Policy Implementation Act into conformity with the specified requirements of the European Union and the amendments made to launch the new funding period 2014–2020 for the common agricultural policy. The Act is also amended by adding provisions in connection with changing the activities carried out with the rural development plan supports, termination of the implementation of the milk production quota, and field book. The Act simplifies the changing of the activities carried out with the supports of the Estonian Rural Development Plan 2014–2020, and provide for the cases when activities may be changed without losing the support. In the case when an agricultural producer has failed to pay the surplus levy for milk production by the due date, the Estonian Agricultural Registers and Information Board will have the right to set it off with the supports paid to the agricultural producer. Persons engaged in agriculture will have to enter also the data set out in the conditions for receiving the support, in addition to the data required by the Water Act, into the field book. For example, data concerning the taking of soil samples and the results of analyses thereof, monitoring of plant pests, crop varieties grown, etc. It is information that in most cases is already entered into the field book. The amendment is necessary in order to ensure more effective checking of the requirements for receiving the environmental payments given within the framework of the Estonian Rural Development Plan 2014–2020, as well as organic farming payment. For the second reading, the Bill was amended by adding provisions under which the school milk aid and the school fruit and vegetable aid will be replaced with the school scheme aid arising from the relevant European Union legislation. The aim of the Act on Amendments to the Organic Farming Act (282 SE), initiated by the Government, is to take increasingly more products to the consumer labelled as organic, and to facilitate the consumption of organic food and increasingly wider use of organic raw materials in mass catering operations. The Act provides for the possibility to refer to organic raw materials through a mark developed specifically for caterers. There will be possibility to indicate the percentage of organic raw materials within three ranges: over 20 to 50 per cent of raw material is organic; over 50 to 80 per cent of raw material is organic; over 80 to 100 per cent of raw material is organic. It will be possible to calculate the range on the basis of the quantity or the cost of the agricultural products brought for preparation of food to the enterprise in the previous month. Data will be obtained from the accounting records of the enterprise. Caterers are given the possibility to decide for themselves whether the quantity or the cost of the products is taken as the basis for calculating the percentage. The current Act allows use of the national ecolabel in mass catering operations if at least 95% of the raw material used originates from organic farming, but this is difficult to comply with in many enterprises. The Act on Amendments to the State Budget for 2016 Act (296 SE), initiated by the Government, does not change the total volume of the state budget revenue and expenditure, but the current year’s expenditure of ministries and other authorities are specified. The Act covers 98 motions to amend in total. With the Bill on Amendments to the Social Welfare Act and Amendments to Other Associated Acts (317 SE), initiated by the Government, the childcare service for children with a severe or profound disability provided for in the Social Welfare Act will be changed into a social service organised by local government. This will change the funding of the childcare service for children with a severe or profound disability which is funded from the state budget – in the future, it will be funded through the local governments support fund. According to the Bill, additional one million euro will be allocated from the state budget to support the parents of children with a profound disability. The explanatory memorandum notes that, at present, the state funds the supporting of children with a severe or profound disability partially, and it does so through county governments. After the amendment, only local governments will engage in the organisation of childcare service, as they know the best the needs of the children and families of their community. In the future, the childcare service organised by the local government will also include children with a severe or profound disability with the specification that the state will partially cover an additional funding need arising from the disability. In accordance with the State Budget Act, the funds for the state-funded childcare service will be distributed to local governments according to the number of children who need the service. Funding will be ensured through the local governments support fund. Organisation of domestic adoption will be transferred from the competence of county governments to the Social Insurance Board in order that all acts relating to adoption would be concentrated into one authority. The amendment will ensure a uniform approach to adoptions all over Estonia. In connection with that, the Child Protection Act, the Family Law Act and the Code of Civil Procedure will also be amended, besides the Social Welfare Act. The Bill on Amendments to the State Borders Act (269 SE), initiated by the Constitutional Committee, provides for the establishment of a five-kilometre wide frontier zone to enhance the surveillance of the Estonian-Russian state border. The Bill on Amendments to the Water Act (316 SE), initiated by the Government, will update the provisions on the use of fertilizers concerning agriculture so as to ensure elimination of the shortcomings pointed out within the framework of the infringement procedure concerning the implementation of the Nitrates Directive which the European Commission has initiated against Estonia. The main changes in the agriculture will be the following: the time limits for application of manure will begin earlier in the autumn period; the data entered into the field book will be specified, and the requirement of drawing up a fertilization plan will be provided for. The Bill will affect agricultural producers who will have to implement stricter water protection measures. Originally it had been planned that the time limits for application of liquid manure would enter into force as of 2023, but according to the Bill they will be established already starting from next year. At present, application of nitrogen-containing mineral fertilizers and liquid manure is prohibited from 1 December to 20 March. In 2018, application of liquid manure will be prohibited from 15 November to 20 March, and, in autumn 2019, application of liquid manure will be prohibited from 1 November. Starting from 2017, application of nitrogen-containing mineral fertilizers will be prohibited from 15 October to 20 March. The amendments will specify the data entered into the field book. In the future, the quantities of crops harvested will have to be entered into the field book, on the basis of which it will be possible to evaluate the efficiency of the use of fertilizers planned before sowing. With that, the general requirements for balanced fertilization set out in the Directive will be transposed. Agricultural producers note it down at present, too, but it has not been provided for as an obligation. In the future, those who use 100 ha or more arable land and use nitrogen-containing fertilizers will have to draw up a fertilization plan. Starting from 2019, persons who use 50 ha or more land will have to draw up a fertilization plan. The requirement is related to the requirement of the Directive according to which plants must be fertilized with a quantity of fertilizer sufficient to produce crop, and over-fertilization must be avoided. The Bill on Amendments to the District Heating Act (264 SE), initiated by the Government, will encourage heating undertakings to use more stable, more environmentally sustainable and cheaper fuel. The aim is to ensure to district heating consumers as favourable and stable heat energy price as possible, together with as effectively as possible organised heat supply. Lowering of the district heating price requires large-scale investments for which the investor needs a long-term and stable regulation. For that, the Bill provides for enabling greater profitability if the investment ensures a significantly more favourable district heating price for the consumer. To ensure more stable regulation, a regulation that so far was in the methodology of the Competition Authority will be introduced into the Act. An important amendment in the Bill is also the scrutiny of the buyer of a heating undertaking operating in a larger network area. Similarly to the scrutiny before buying a natural gas transmission network, according to the amendment, a buyer of a boiler plant or heat pipeline operating in an area with an annual sales volume exceeding 50 GWh will also have to undergo a scrutiny from the internal security standpoint performed by the Ministry of the Interior. 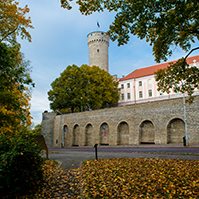 Tallinn, Narva, Tartu, the interconnected network area of Ahtme-Jõhvi and Kohtla-Järve, Sillamäe, Pärnu, Viljandi and Jämejala, Kuressaare, Võru, Haapsalu, and Paide network area are areas with an annual sales volume exceeding 50 GWh. The amendment will increase energy security. The Bill will provide for an obligation of local governments to draft a decision on the planning of the development of the heating sector by 31 December 2017 at the latest. This decision will provide for the future perspectives of the district heating network area located in the administrative territory of the local government for at least ten years. To support the analysis which will be the basis for the decision, a grant aid support measure has been established, which will allow the covering of up to 90% of the costs of the analysis. The Bill has been drawn up in cooperation with the Competition Authority, and the Estonian Power and Heat Association uniting district heating undertakings. The Bill on Amendments to the Traffic Act, the State Fees Act and the Product Conformity Act (281 SE), initiated by the Government, will implement the relevant EU Regulations on the type-approval and market surveillance of two- or three-wheel vehicles and quadricycles, and agricultural and forestry vehicles, and on tachographs in road transport. The Road Administration will be given the rights of a market surveillance authority. Thus the Road Administration will be able to check that not only vehicles registered in the traffic register but also other vehicles subject to type-approval that are made available on the market for the population would have a type-approval. A type-approval is necessary in order that it would be proved that vehicles comply with the safety and environmental requirements. Besides, the EU single type-approval allows vehicles to be sold and used without restrictions in the EU. The amendment will have a major impact on the market for vehicles that do not have to be registered in the traffic register, e.g. mini mopeds. The Bill will amend the requirements for application, issue and revocation of cards of drivers of power-driven vehicles equipped with a mandatory tachograph. The Bill on Amendments to the Electricity Market Act (290 SE), initiated by the Government, will change the principles of the support scheme for electricity generated from renewable energy sources or in an efficient cogeneration regime. The aim of the Bill is to make the support scheme less burdensome for the consumer. The payment of the support will be linked to the target for generation of electricity from renewable energy sources assumed by the state, and the receiving of the support will be linked to the winning of adjudication. This will ensure strong competition in the generation of renewable electricity and will enable to achieve the target of the state in a manner that is the least burdensome for the consumer. The Bill regulates that, if the generation volume of the existing generating installations is not sufficient to achieve the state’s target for generation of electricity from renewable energy sources or for electricity generated in an efficient cogeneration regime, the Government will, at the proposal of the Minister of Economic Affairs and Infrastructure, organise an adjudication to obtain additional generation volume. In addition to that, the existing producers who will continue to receive the support on the basis of the current support rates until the end of the 12-year support period will be singled out. Thus the existing support schemes will be gradually reduced. The Act will be amended by adding the regulation concerning international cooperation mechanisms, and thereby the relevant EU directive will be transposed. The directive encourages the deployment of energy from renewable sources. Within the framework of the trade in statistics which falls under a cooperation mechanism, Estonia will have the possibility to sell the renewable energy statistics exceeding its target to interested Member States. 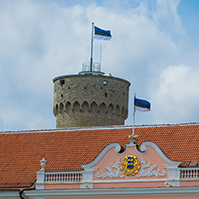 If the statistics quantity needed within the framework of the trade in statistics is larger than Estonia’s excess, the Government can organise an adjudication to obtain additional statistics, according to the Bill. The European Union has set a target of a 20% share of energy from renewable sources in overall Community energy consumption by 2020. Estonia achieved the national target for renewable energy generation, 25 per cent, already in 2011. In 2014, 26.52 per cent of energy was produced from renewable sources in Estonia.